When you come home to find a mess on the floor, it is easy to assume that the dog vomited. 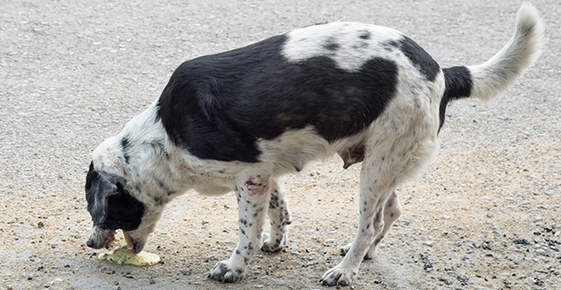 Vomiting is very common in dogs, as they often eat weird things! There are actually many other causes of vomiting, including parasites, kidney disease, liver problems, pancreatitis, and food allergies. Overall, there are probably at least 101 causes of vomiting. When you take your dog to the veterinarian, the doctor will ask questions and determine if the dog is truly vomiting, or if the dog really has regurgitation, because they have different causes. You will be asked if you saw the process and what the mess looked like. Vomiting has many causes, but results in the stomach ejecting its contents through the mouth. Very active vomiting can also cause intestinal fluid to be brought up. When vomiting, a dog will often precede the act by retching, actively using the abdominal muscles, to force the contents up and out of the body. The process is often strenuous and dynamic. The vomitus, meaning the material that was vomited up, comes from the stomach or intestines, and therefore contains a lots of fluid. The fluid may be a range of colors, from clear, to white foamy, yellow, green, brown, or even red if there is fresh blood. Blood that has been in the stomach longer will become digested, and look like coffee grounds when vomited up. Of course, there could be many other things in the vomitus depending on what was eaten. There could be dog food, which will look like it is starting to digest rather than its original form. Non-food material may look digested, or it may look like the original form depending on whether the material can be digested. Objects like metal, plastic, and many fabrics cannot be digested. Regurgitation, on the other hand, comes from problems in the esophagus, the tube that leads from the mouth to the stomach. A dog that is regurgitating will just burp up material. There is no active movement from the abdominal muscles pressing on the stomach. Since the food or other material does not make it to the stomach, it is not digested; food will look much like it did when it was eaten. Sometimes there can be water in the material that is regurgitated if the problem is a megesophagus. This is a disease where the esophagus is not a straight tube, but becomes flaccid and dilates. Things that are ingested may just sit in this dilated area, not reaching the stomach, and will be regurgitated later. Often, there can be fluid with food that is regurgitated. Diseases of the esophagus include ulcers, inflammation, foreign bodies stuck inside the esophagus, tumors, and megesophagus. This is why it is important to know if that mess on the floor is caused by vomiting, or by regurgitation.